There was an election for US Senator this week in Alabama. It was decided by less than a percentage point. A few thousand votes changed history. You can do this by voting. You can do this by contacting your elected officials. You can do this by becoming an elected official. Keep voting. You may not believe in climate change but your insurance company does. This week I helped bury a stranger. Cancer took her away from a loving husband and son and a congregation that made them both possible. She built a community that mourned her passing and will carry out her wishes. There have been a lot of news stories about people abusing their power. One solution is to build organizations to check the concentration of power at the top, to hold those responsible. It means a steady drumbeat of vigilance and transparency. The stranger saw injustice. People were taking advantage of vulnerable disabled people and she created a group of people to fight it. I never knew the stranger, but she will be known by her works. A friend sent a message late Sunday night that there had been a shooting Las Vegas. Their daughter had gone to a concert with a friend and they had not heard from either of them since the shooting. They thought they had done everything for their daughter, nice house, good schools but nothing prepared her for the chaos of the twenty-first century. Dozens were killed and hundreds wounded. The two young women survived with minor injuries and lost their phones. Her parents are now for gun control. Frankly, they did not care about other people until they became other people. When going to an event, take precautions. Wear sensible shoes. Know where the exits are. Keep moving away. Agree on a meeting place. Learn basic first aid. Vote for the right people. Soon anyone born at the turn of century will be turning eighteen over the next year. Before the Industrial Revolution, the average lifespan was about 35 years. You turned eighteen and reached your majority. Essentially you graduated from high school and had to schedule a mid-life crisis. If your grandparents or parents lived to 65, it was a miracle. How long an eighteen year old will live depends on their actions today. Things will get steadily worse. Learn from your parents. Avoid big cars, big houses, big debts. You can work for a better world where people help each other. You can vote. You can be elected. You can survive. May the majority of your years be ahead of you, in spite of your idiotic parents. Copyright 2017 Dj Cline All right reserved. History is a minefield that stretches from the past to the future. Any step you take will have an unknown result. People in the past might be heroes but they were still just people. They made decisions in their social context with the information available at the time. Progress happens faster now. We have a lot more information than they did. We need to rethink the past and the future. Maybe we need new heroes. Maybe you. There are a lot of good people out there. Be one of them. We are well into the 21st century and there are still bad guys arguing about the Civil War and WWII. I am beginning to wonder if it is all the same war. Every day is Saint Crispin’s Day. People often ask why I am not on more social media. I have yet to see any reason to do more. In fact, I am considering doing less. I am considering dropping Twitter. It would provide an extra few minutes a day to interact with the real world. An old friend back east has Alzheimers. The care is expensive and there is no cure. It is devastating his family. One of things he campaigned for was Medicare for all. It has been a rough month. I know people all over the country worried about getting healthcare. Just about all of them have pre-existing conditions. The youngest case I know about is a kid born one month premature in a rural red state. HIs mother could not get pre-natal care because the women’s clinic closed. She works in retail and her husband is in construction. The kid’s care is expensive, and his chances of survival are fifty-fifty. If he lives, he will have a pre-existing condition. The parents need to figure out how to take care of their kid, not how to deal with insurance companies. They realize now that they voted for people who are making their kid’s life nearly impossible. Maybe you are a not a doctor or a millionaire, but you can save the lives of millions of people by pressing your elected representatives for Medicare for all. On Jul. 20, 2017, New York Magazine’s David Wallace-Wells wrote “The Uninhabitable Earth” about human caused climate change disasters. He covers almost everything that is happening or likely to happen over the next few years. People in the future will quote this remarkable article word for word. To make sure they exist, you have to get active. Start reading. Now. So why can’t we see it? In his recent book-length essay The Great Derangement, the Indian novelist Amitav Ghosh wonders why global warming and natural disaster haven’t become major subjects of contemporary fiction — why we don’t seem able to imagine climate catastrophe, and why we haven’t yet had a spate of novels in the genre he basically imagines into half-existence and names “the environmental uncanny.” “Consider, for example, the stories that congeal around questions like, ‘Where were you when the Berlin Wall fell?’ or ‘Where were you on 9/11?’?” he writes. “Will it ever be possible to ask, in the same vein, ‘Where were you at 400 ppm?’ or ‘Where were you when the Larsen B ice shelf broke up?’?” His answer: Probably not, because the dilemmas and dramas of climate change are simply incompatible with the kinds of stories we tell ourselves about ourselves, especially in novels, which tend to emphasize the journey of an individual conscience rather than the poisonous miasma of social fate. Some things you have to see through to the end. Others you have to see through to the beginning. Sometimes its both. Either way, see it through. I just talked to someone who thought the G20 was a phone. They probably think Hamburg is a sandwich. This is a sign of the times. It is in the building of a Fortune 500 company in San Francisco. The company has been in the news for every sort of scandal but this issue they managed to figure out. Down the street is a building from the 1920s. It has one restroom on every floor, because when it was built there were only men working in that building. For a long time, the awkward solution for that building was to have a restroom for women on alternate floors. 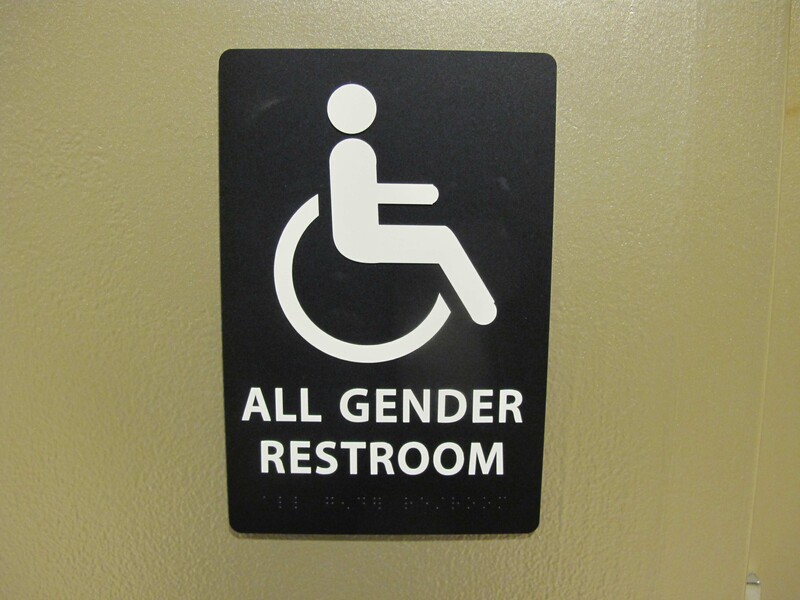 The building management is thinking about converting all the restrooms to the new standard. The attitudes change but the plumbing will essentially remain the same. Oh, the remodeled rooms will be handicapped accessible. Help your Father. Contact your Senators and Congressional Representatives and encourage them to support Medicare for all. The sign said Personal Watermelons for three dollars a pound. They were about the size of a bowling ball. The sign raised all sorts of questions. Had watermelons become so large as to seem impersonal? Was it simply a Silicon Valley marketing strategy to differentiate from older larger mainframe watermelons or even smaller mobile watermelons? Did they really expect one person to sit down and eat this watermelon in one sitting? The US Congressional Budget Office estimates that the Republican Healthcare bill will deny twenty four million people health insurance. Eventually all those people will die. I was standing in a military cemetery with the graves stretching in orderly rows and wondered how much space it would take to bury that many people. Twenty four million soldiers died in WWI. Imagine if you could save the lives of that many people. You can. Contact your Senators and congressional representatives. Tell them you want Medicare for all. The president has left the country. He is probably looking for a place without extradition to the United States. Despite everything going on, we still need affordable education, healthcare, a cleaner environment, jobs etc. Do something nice for mothers across the country. They take of you, you take care of them. Work toward universal health care for all. With the market headed down, unemployment headed up, foreign relations going sideways, human rights going backwards and global temperatures rising. Can you imagine what the next hundred days will bring? Be nice to the only planet you can live on. “But Callahan says right wing donors have been more effective when it comes to shaping economic and fiscal policy, bankrolling big think tanks in Washington that advocate for cutting the size of government. Those include The Heritage Foundation, which now plays a big role in the Trump administration.” As a result, poor people are disenfranchised. If you find yourself in a tweetstorm, seek shelter in a basement or interior room, wherever the wi-fi reception is worse. Last week an important part of an Atlanta highway burned down and collapsed. Allegedly a homeless person with a substance abuse problem started the fire. This is an example of how ignoring the problems of other people catches up with you. Fight poverty. Build infrastructure. Help other people.